We’re always looking out for functional storage that looks as good as the job it does. Here’s something that was designed for adults, but just screams nursery to us. Often it’s the small and pretty little touches that can really turn a room from purely a functional space to somewhere you simply love to be. This is never more the case than when it comes to storage, and particularly storage for little things that might not have an obvious home. 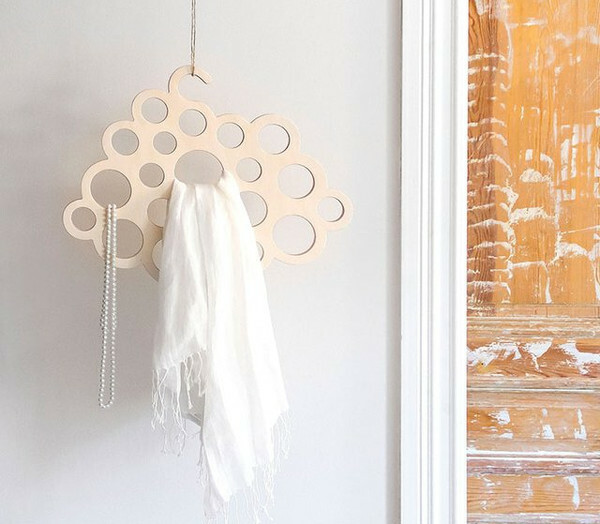 This simple and modern wooden storage hanger called Cloud is just such a pretty little touch, and it would have so many uses in a child’s room, from displaying jewellery and headbands, to tights and leggings, socks, or just about anything else that you can poke through its little holes. It’s made from birch plywood and is available in either natural birch or stained white. It will fit neatly into a wardrobe, or is beautiful enough to be a statement piece on its own. The Cloud hanger is from Reykjavik Corner Store and is priced at US$120. You can pick it up from Fancy.